Using Node.js, we can create web applications easily. 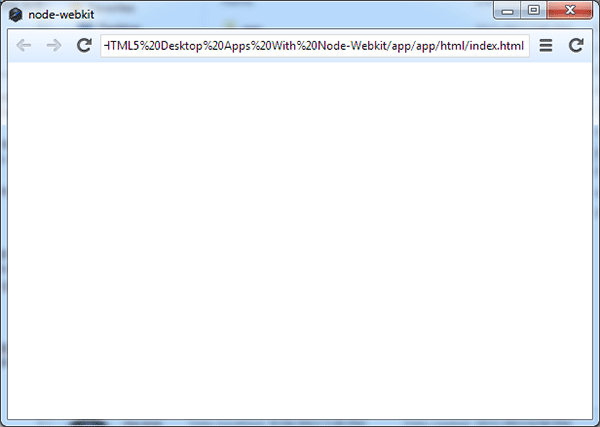 Now, thanks to the node-webkit we can also create desktop apps with it, using a unique combination of HTML5 and Node. The library combines WebKit engine and Node.js in a unique way. Both WebKit and Node share the same context, allowing you to write your code like it’s meant to be executed in a browser, but with the addition of all Node’s features. The list of uses is endless. You can create business apps, text and image editors, games, presentations, admin panels, etc. Just name the desktop app that you would like to create, and I can assure you that it will be possible with node-webkit. In this tutorial, I will show you how to get started by showing you how to create a simple text editor. Now the only thing that will change when you open the app will be the title. As you can see, the code looks exactly the same as if you were writing it for Node. 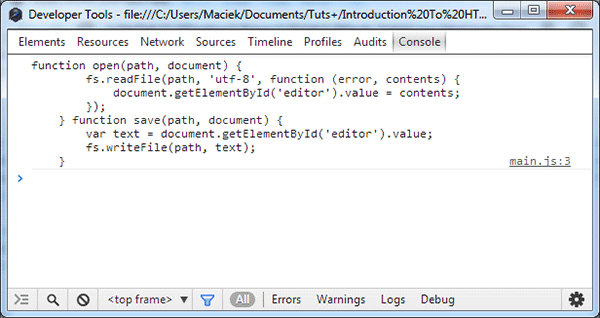 But then we use document.write to put the file contents on the page. No need to setup any local server. As you can see this will be a static class with two public methods – one for opening the files and one for saving them. Pretty simple right? The function accepts the path to the file as the first parameter and puts the file’s contents into the element with an id of “editor”. We also need to pass the document object to the function because the script is called using Node’s require and it doesn’t have access to the WebKit stuff directly. Now if you go to the developer tools console and click the developer refresh button in the right corner of the window you should see the two functions from this module logged. This is another useful thing in node-webkit – your console.log calls are being displayed in the developer tools console, so it’s easier to debug your apps. This code is responsible for showing the Open and Save dialogs. The clickInput function does the main job here – it simulates the click event on the input element – in a normal browser, this would be impossible from security reasons, but here it’s not a security threat at all. Later, there is a normal keyup event handler that checks if the proper key combination was pressed (Ctrl+O or Ctrl+S) and “clicks” on the inputs. Note that this would also be impossible to achieve in a browser – combinations like Ctrl+O and Ctrl+S are reserved for the browser’s internal use and no event fires when they are pressed (only Firefox fires events for them). Now press the developer refresh button and you should see the appropriate dialog when you press Ctrl+S or Ctrl+O. They of course do nothing for now. Thanks to the module created earlier, the code is really simple. This is also possible thanks to node-webkit, because in browsers (again for security reasons) the value of the file input element is set to a fake path – here it’s the path which was selected. Now open the app (or press the developer refresh button, if you didn’t closed it) and you should have a perfectly working text editor. And viola! If you refresh the app, now you can press Ctrl+N to open a new window. This function does differ from the normal window.open though. You can pass various window options as the second parameter. The list of what you can set there is available in the documentation. menu.items is the first item of our application menu (you can also assign it to a variable when creating it if you want to). We are appending new items to its submenu, and each item gets a click callback to handle the click on it. The gui.Window.get method gets the current window, so we can close it when the user selects the Close option in the File menu. 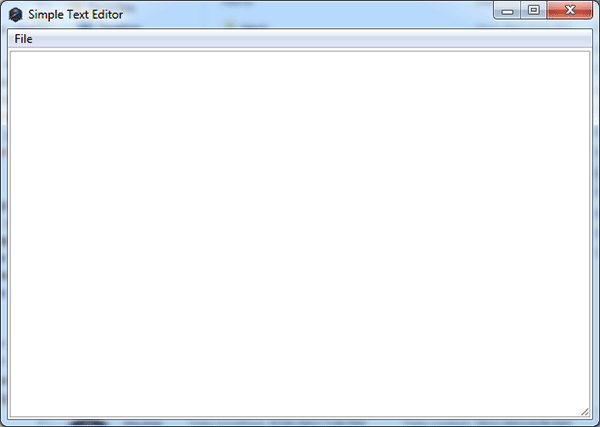 Again, we are using gui.Window.get to get the current window, then we are assigning our menu to its menu property. Please note, that even though we can assign a different menu to every window, on OSX (Mac) one app can only have one menu (which is global for all windows), so if you want your app to be used on Macs, you should avoid using different menus on different windows. Packaging the app is pretty simple. Just create a .zip archive with all your assets (all of the files you created, without the files supplied with node-webkit) and change its extension to .nw. That’s all. If a user downloads node-webkit and your package, they only need to put it in the node-webkit’s directory and run the nw executable. Detailed descriptions, with a few more tips, are available on the node-webkit’s github. Now your editor is ready to be shipped to your users. 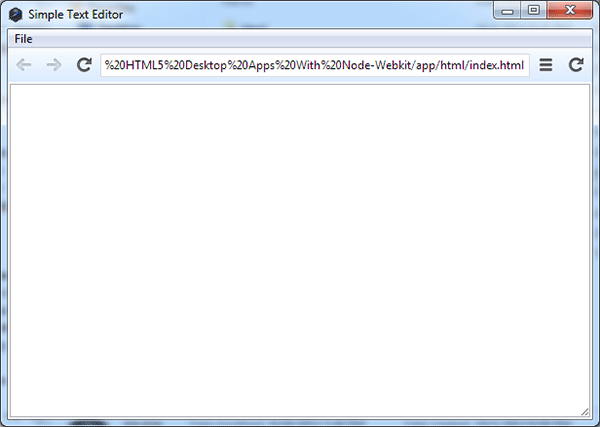 As you can see, node-webkit is a very promising and powerful library. With frequent updates and fixes, and being supported by Intel, there’s almost no chance that it will be discontinued, which can sometimes happen with open source projects. Share your thoughts about this project in the comments below. 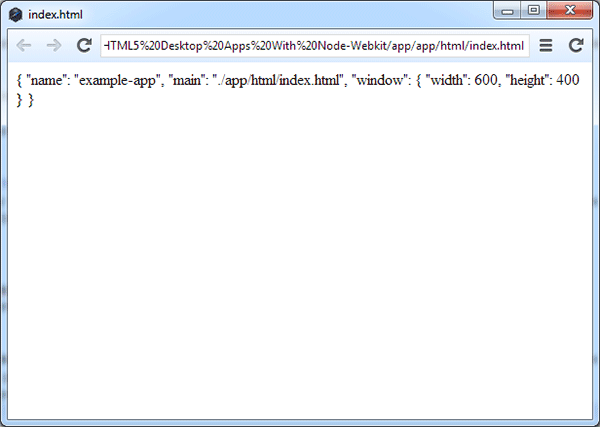 I personally think it’s the best thing out there if you want to create a desktop application using Node.js and HTML.